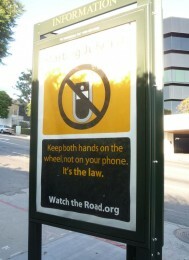 Last August, Mayor Antonio Villaraigosa stood with bicycle safety advocates outside city hall to unveil a large poster with the slogan “Give me 3” and announced that the message—that motorists should give bicyclists at least three feet of clear space when passing—would be appearing in bus shelters and public amenity kiosks (PAKs) throughout the city. Kiosks like this one are installed on public sidewalks as part of the city’s coordinated street furniture program that also includes transit shelters, vending kiosks and automated toilets. A private company, CBS/Decaux, installs and maintains the street furniture items, and the city shares in the revenue from the advertising panels, which is guaranteed to bring at least $150 million to city coffers over the 20-year life of the program. This is not the first time public service messages intended for motorists have been visible only to passersby on the sidewalk. Last year, a message warning of a new state law mandating “hands-free” devices for drivers using cellphones appeared on PAK panels such as the one at right on Vine Street in Hollywood, which faces directly away from the street and into a six-foot high hedge. CBS/Decaux is a joint venture of CBS Outdoor and French billboard giant, JC Decaux. CBS Outdoor is a part of the U.S. media conglomerate, CBS Corporation. It was originally a division of Viacom, along with other companies, including Paramount Pictures.